Kais has a degree in Sports Science from the <?xml:namespace prefix = st1 ns = "urn:schemas-microsoft-com:office:smarttags" />University of Tarin. He is the sone of Peeter (insurance salesman) and Maie (architect). He has an older brother (Kaarel). Kristjan and Kaarel competed in 20 FIVB Beach Volleyball events with a fourth together in a 2002 Challenger event in Kiev, Ukraine. Favorite athletes - Michael Jordan and Zinedine Zidane. 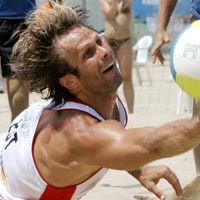 Favorite Beach Volleyball players - Emanuel Rego and Franco Neto. Most memorable moment in life - Still to come. Most memorable moment in Beach Volleyball - A 2004 fourth-place with Rivo Vesik in Serbia. His favorite Beach Volleyball site - Parnu Beach, the No. 1 site in Estonia due to the atmosphere and his memories there. His favorite international Beach Volleyball site - Rio de Janeiro because of the people and the city. People who have helped him in life - His parents and Lennart Raudsepp. People who have helped him in Beach Volleyball - His father. The best Beach Volleyball advice - Sometimes it�s the best to shut up on the court. If he could trade places with anyone in life - Nobody. If he could trade places with anyone in Beach Volleyball - Karch Kiraly. The three people he says he would like to have dinner with - Adolf Hitler, Attila the Hun and William Wallace. When your beach volleyball career is over, what would you like to do? - Enjoy life with family.